Su and Sarah discover a love letter in Naru’s closet, which they and Keitaro assume to be written for him. 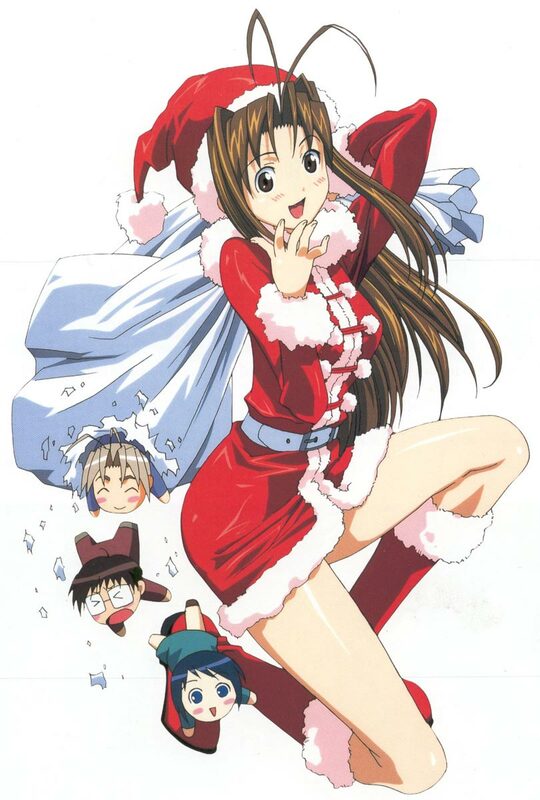 Estatic, Keitaro decides to profess his love to Naru on Christmas; unfortunately, his excitement leads him to injure his ankle. Still, he continues to study hard while working part-time to buy Naru a Christmas outfit she likes, only to discover that the letter isn’t for him. Dejected, Keitaro wanders through the streets – what will Naru do? Will she do anything? RED everywhere. Some of the girl dresses in particular Santa outfits in this episode, and the outfit Keitaro buys for Naru is classy Santa chic (hehe). Christmas music, Christmas trees and Christmas decorations abound throughout, and Keitaro is dressed as Santa for what seems like half the episode. Getting over yourself and appreciating the one you love. While no one will mistake this episode for anything remotely religious, to me, it’s still the granddaddy of Christmas episodes, focusing on the romantic love associated with the holiday in Japan. After watching over a dozen episodes (some for the umpteenth time) in the last few weeks, I’ve still found none as wonderful as this. Keitaro, our bad luck/maybe perverted/man of steel hero sacrifices and sacrifices, only to be left in the dust by Naru. This time, however, even the other girls are aghast at how she’s treating him. But she makes up for it in the best and most emotionally moving confession in the series. Add to that a nice little side story about Shinobu’s family, and you have what I think is the very best episode of Love Hina.